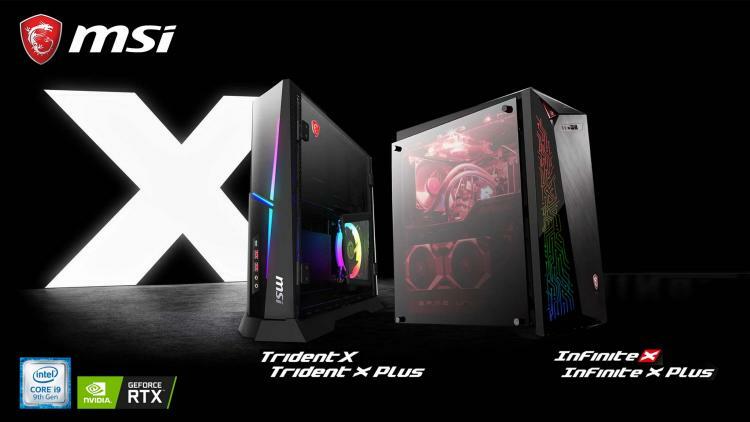 MSI presents its next-generation Infinite X 9th and Trident X 9th Gaming Desktops featuring the 9th generation Intel Core processors and NVIDIA GeForce RTX 20 Series graphics. The MSI Infinite X Plus 9th and Infinite X 9th gaming desktops feature the 9th generation Intel Core i9-9900K processor and the MSI GeForce RTX 2080 Ti 11GB GDDR6 graphics card. It features MSI exclusive Silent Storm Cooling 3 PRO cooling system and RGB lighting powered by the MSI Mystic Light. The MSI Trident X 9th and Trident X PLUS 9th also features the 9th generation Intel Core processors with an option of either the i9-9900K or the i7-9700K processor. It also features the MSI GeForce RTX 20 Series graphics cards. Graphics options for the small-form-factor MSI Infinite X 9th and Infinite X PLUS 9th are the RTX 2070, RTX 2080, and RTX 2080 Ti graphics cards. Both SFX gaming desktops feature the MSI Silent Storm Cooling 3 cooling system as well as RGB lighting powered by MSI Mystic Light. Check out our review of the 9th generation Intel Core i9-9900K here. No information on pricing and availability for the Infinite X 9th and Trident X 9th Series gaming desktops as of this writing.